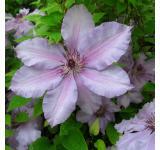 When you say perennial vines most gardeners, with good reason, immediately think of Clematis. After all, it is hard to beat a Clematis vine for the beauty it can bring year after year but there are other perennial vines that have a lot to offer too. 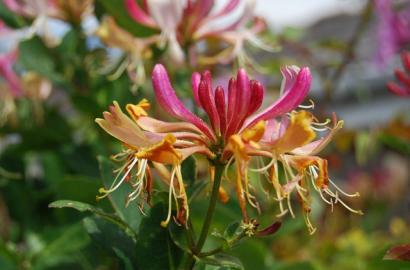 Honeysuckle and Trumpet Vines are two perennial vines that I’ve had a lot of positive experience with and they can make an interesting addition to your garden. 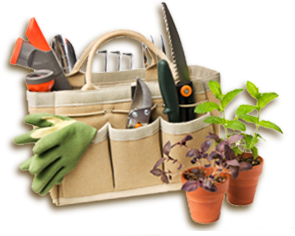 Additionally, because they are very adaptable these vines can solve a lot of potential challenges in your yard ranging from soil erosion to hiding eyesores but they do need regular pruning to keep them under control! Both of these vines do have a reputation for being a potential nuisance plant and it is true that in many regions of the country they are considered to be an invasive species. You’ll probably want to check their status in your local area before you add one to your landscape but if you’re fortunate enough to be able to do so you can be in for a real treat! Not only can you use these vines to add a vertical element to your garden but they also look great crawling along the ground or weaving their way through trees and shrubs. I grow several types of honeysuckle in my garden. The first has a red flower with a yellow pistil center that has been trained to engulf my mailbox. The first bloom cycle of this honeysuckle is very heavy and if I prune the vine after it finishes its first bloom cycle I can get a smaller blooming period later in the season. The second honeysuckle vine in my yard grows on a trellis next to my porch and has a pure yellow flower which blooms so profusely in May and June that you can’t even see its green foliage. Both of these honeysuckles are magnets for aphids which can cause the flowers to become distorted so I spray the flower buds once a week with insect soap as a precaution. The last honeysuckle that I grow is one of my most cherished plants. It is a wild honeysuckle that I plucked from a common area behind my home and trained into a shrub. Unlike the other two honeysuckles I grow which really have no scent, this honeysuckle has the most heavenly fragrance. On cool spring evenings, I can smell it as soon as I step out onto my deck which is 30 to 40 feet away from the vine! I do have to prune this vine frequently to keep its shape but the extra work is worth it! Another nice feature of this vine is even though I grow it in full sun it would also be a good choice for shady conditions too. Unlike Honeysuckle vines which curl around their supports to anchor themselves Trumpet Vines climb by using tendrils that adhere to any surface that is near them. 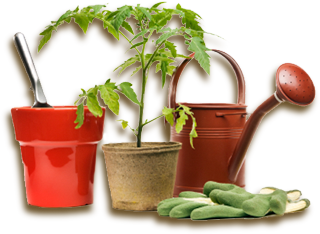 This can include wooden surfaces and bricks so it is a good idea to grow this vine on a strong support that is at least 1 to 2 inches clearance from these surfaces or you’ll have problems with tasks such as painting. Trumpet vines have foliage that reminds me of a fern which remains on the vine year round in the south but falls off in northern climates. 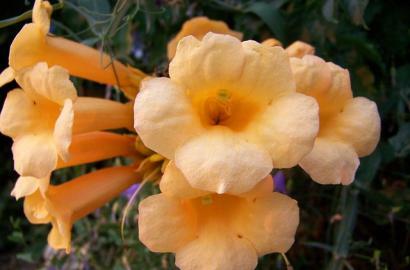 The large flowers have a tubular shape and are very showy. Orange is the most common color but the flowers also can come in yellow and red as well. This vine grows rapidly and can reach lengths of up to 20 feet in one growing season. Trumpet vines bloom during the summer after Honeysuckle vines have completed their blooming cycle. They prefer full sun but will tolerate some shade and while they prefer rich, moist soil they can tolerate dry soil conditions as well. While Trumpet vines are pretty tough I have found that they seem to have problems with stink bugs which can cause it to drop its flower buds before they bloom. Another nice thing about Trumpet vines are that they are magnets for hummingbirds and butterflies which are attracted to the color of their flowers and its sweet nectar. Finally, as I mentioned previously both of these vines have an aggressive streak and require regular attention to keep them getting out of hand. Trumpet vines are particularly susceptible to this and I’ve seen new vines sprout up over 20 feet from the original plant. Despite these characteristics I’ve found that both Honeysuckle and Trumpet Vines make a fine alternative to more well-known perennial vines and they could make a great addition to your landscape.